We are entering the last month of the year with the uncertainties that fuel our thoughts about the coming 2019 New Year. What does the influence of lunar phases have on us at the end of the year? Here are the recommendations of the lunar calendar for December 2018. The uncertainties of the end of the year and especially that of 2019 are approaching fast. There is no point in being discouraged or allowing apprehension about the future and the need to see your situation in 2019 make you sink. Concentrate on the present, live it thoroughly. If you have already started to take stock of 2018, you can already start organizing your 2019 projects (a savings plan, the opening of a business, etc.) during this lunar phase. Beauty treatments, a change of look or a diet will be effective between the 7th and the 13th of December. In love, making concessions and new projects will increase the couple’s complicity and the singles match up. This date announces a phase of positivism, love, and abundance. 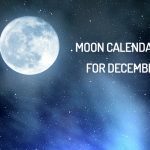 This phase of the lunar calendar for December 2018 will start from 19h08. It is conducive to the rituals of love, abundance, wealth, etc. This is a good period for remedies against fatigue and toning remedies for the liver and pancreas. In terms of human activities, until December 21, all intellectual activities will be favored. On the health side, the excitement caused by the growing moon will help you to put yourself into a diet or end old habits that make you sick. It’s a time of great movement, where things are accelerating in love and work. Take the time to make the necessary changes or correct some approaches to better prepare you to enter the New Year. Emotions and sensations will be sharpened. Under the effect of this moon, relations can be disturbing, due to an obsession. Keeping your balance during this lunar phase will not be easy. End-of-the-year races, family reunions or work meetings should not take your head. You just have to learn how to organize and understand that this phase is quite complicated for everyone. Pay close attention to excessive spending during this time. Avoid all that is surgery related, between December 22nd and 27th. This phase of the lunar calendar for December 2018 coinciding with the end of the same year is also the time to clean, sort things out, get rid of all that we no longer want. Enjoy the waning moon between December 29 and 31 to cleanse and purify you (crystals, habitation, sacred space, body, etc.). This is the period of great rituals. All rituals to remove obstacles, slow down, undo what has been done, will be more effective during this period. The rituals that you will find on our site will help you to finish the year 2018 and start well 2019.